Facebook announced a phone! No, Facebook just announced Facebook Home. Facebook announced a home? No, it's just a home screen. 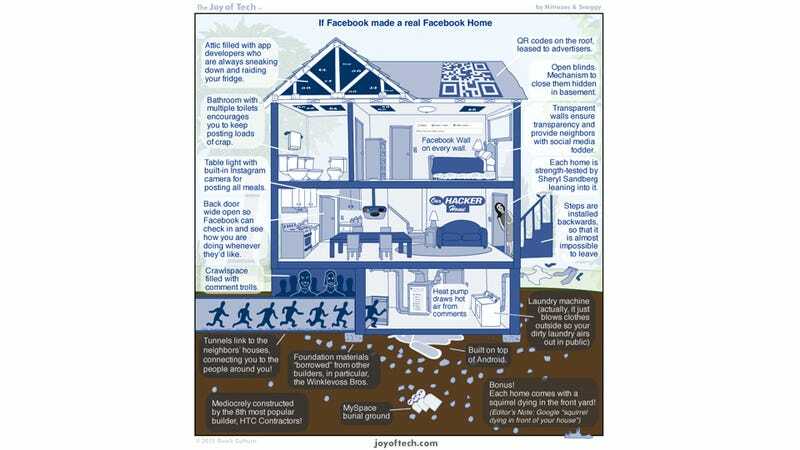 Hmm... what would a real Facebook home actually look like? The guys at Joy of Tech wondered just that and created a comic that shows what Facebook distilled into a home would look like. Foundation built by Winklevii, open doors because no privacy, tunnels for "friends" to come in, Instagram cameras set up at the dinner table and so much more.